SSC CHSL Examination for the year 2015 has been scheduled for the following dates, which are 1st Nov, 15th Nov and 20th Dec 2015. Since the prospect of long-term preparation for SSC CHSL (10+2) 2015 is out of the question, OnlineTyari has devised a final plan of execution for you all aspirants to cover each and every loophole in your exam preparation and help you gain those extra marks that further ensure your ascension to the next level. SSC CHSL (10+2) Recruitment Test is an objective pen and paper format exam which focuses primarily on analysing a candidate’s grasp over concepts based on Quantitative Aptitude, General Intelligence, English Language and General Awareness. The examination is spread out in well designed 200 Question Grid, with the same number of questions from each section. There are no sectional cut-offs, which is good but the time allotted is 120 minutes, which can be challenging to some extent. So going further into the selection criteria for the next level of SSC is not the objective here. OnlineTyari believes in smart work and strategic planning, which is why OT presents a combined preface of possible scoring sectional topics, SSC CHSL (10+2) Examination Trends and Last Minute Preparation Tips for acing SSC CHSL (10+2) 2015 Recruitment Exam. 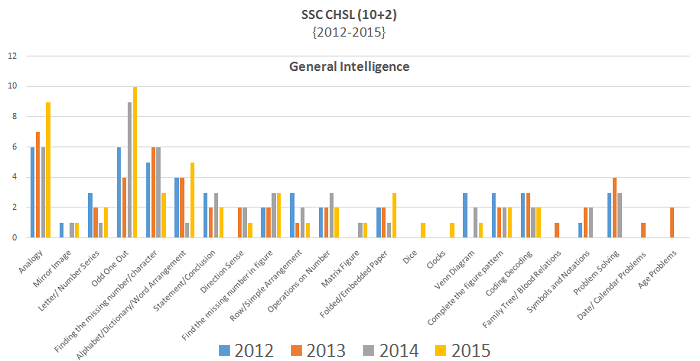 Analyse these trends exhibited by SSC CHSL (10+2) Recruitment Examination over the years and learn about the various topics that tend to appear more frequent in the section of Quantitative Aptitude, General Intelligence, General Awareness and English Language. You will be able to clearly figure out which question is from which topic on inspection. The areas in which you should focus to compartmentalize time and leverage scores on your side should be. Analogy and Missing Number or Character should be the priority section as it mostly comprises 30-40% of the total sectional weightage. Word Arrangement and Coding-Decoding should be the next in the list of questions you go head to head in SSC CHSL (10+2) 2015 General Intelligence Section. Pay attention while attempting problems based on Statement and Conclusion and Figure Patterns as they tend to confuse most of the SSC Candidates. And if calculation in not your strong suit, maybe skip the Problem Solving Section to avoid any negative marking in the section. The expanse of SSC CHSL 2015 Syllabus is extensive so you need to put your best foot forward to maximize your overall score and improve your chances of cracking SSC CHSL 2015 Recruitment Exam. English Section of the SSC CHSL Recruitment Examination is considered as a major score booster by a majority of candidates. Still there are a few aspirants who are completely dreaded by the questions based on various aspects and applications of English. Here are a few pointers for SSC CHSL 2015 candidates to maximize their individual scores in this section. Cloze Passage and Word Substitution are comparatively easy to solve and should be the first priority for all candidates. The count of questions from this topic is also good. Parajumbles, Spell Check and Sentence Correction Questions have also maintained an easy to slightly moderate pattern through the years and should definitely be the go-to questions for you. Antonyms/Synonyms and Idioms & Phrases will carry 10-20% weightage in the English Language Section. These questions take only a few seconds to solve if and and only if you are familiar with the word or phrase. Do not try and guess the solution as most options are extremely close fitting. A strong command over English Grammarand a good reading speed will ensure better question attempt capacity for Active Passive and Direct Indirect Speech Questions in SSC CHSL (10+2) 2015 Exam. Only rigorous practice could improve your ability in this section. Quant Section heavily relies on continuous efforts. You did practice enough, right? If not, here are a few Last Minute Preparation Tips for scoring better in Quantitative Aptitude Section of SSC CHSL 2015 Recruitment Exam. Trigonometry and Histogram Questions have been prevalent in SSC CHSL (10+2) Examinations over the years and generally are of a moderate difficulty level. Ratio & Proportions and Mixtures require a good understanding of allegation principles. If you are familiar with that, you can easily attempt these questions. Avoid TSD, Fractions and Percentage Problems if calculation is not a key strength of yours. The SSC CHSL Exam Trends indicate Algebra and Pie Chart being quite troublesome for most candidates. If you’ve ignored reading newspapers and keeping yourself updated of the latest happenings around you, it’s better to skip that section now. So if you haven’t given any attention to this section, maybe the above mentioned topics can still save you. To further ensure, these are the actual test papers of SSC CHSL for the Year 2014 and 2013. OnlineTyari caters to both English and Hindi Test Takers. Try out these practice papers and know for sure if you can make it and qualify SSC CHSL (10+2) Examination. Stay connected for more information regarding SSC CHSL Recruitment 2016. To excel in SSC CHSL Examination, download the Best SSC CHSL Exam Preparation App for free. Post your doubts in the comment section below. For better response, post your queries on OnlineTyari Community.